These bar cookies will remind you of an old-fashioned spice cake complete with walnuts and a yummy cream cheese frosting. 1 of 4 Heat oven to 350 F. Coat a 15 x 10-inch jelly-roll pan with cooking spray. Line with parchment or waxed paper; coat paper with spray. 2 of 4 Combine flour, baking powder, cinnamon, nutmeg, salt and pepper in medium-size bowl. Beat butter and sugar at medium speed in large bowl until combined, about 3 minutes. Beat in eggs and vanilla. 3 of 4 On low speed, beat in flour mixture alternately with sour cream, ending with flour. Fold in walnuts. Spread in prepared pan. 4 of 4 Bake at 350 F for 30 minutes or until center is set. Let cool in pan on wire rack. Turn out onto wooden board; remove paper. Turn upside down onto serving platter. 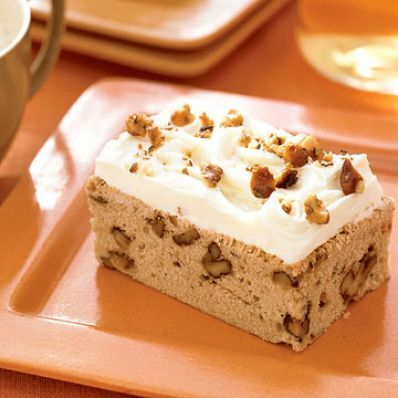 Spread with frosting, cut into 2 x 2-1/2-inch bars and serve, topped with flavored walnuts.